﻿﻿﻿﻿﻿﻿﻿﻿﻿﻿﻿ When Melinda and Derrick Deaton came to us with an idea for their new custom home in Alpine, Utah, we couldn’t have been more thrilled. 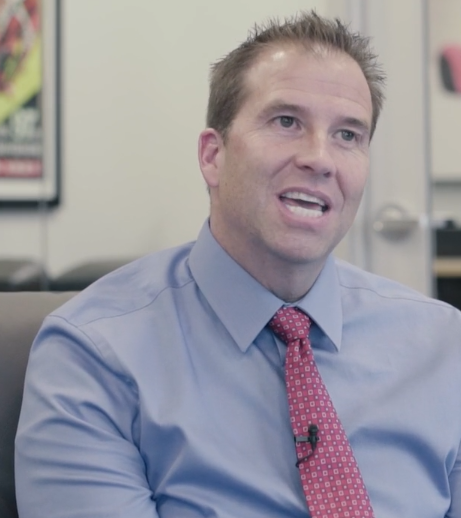 The Deaton family had recently found the perfect property and already had some unique ideas in mind. With these ideas and Melinda’s interior designing on our side, they asked us to tackle the project with them. 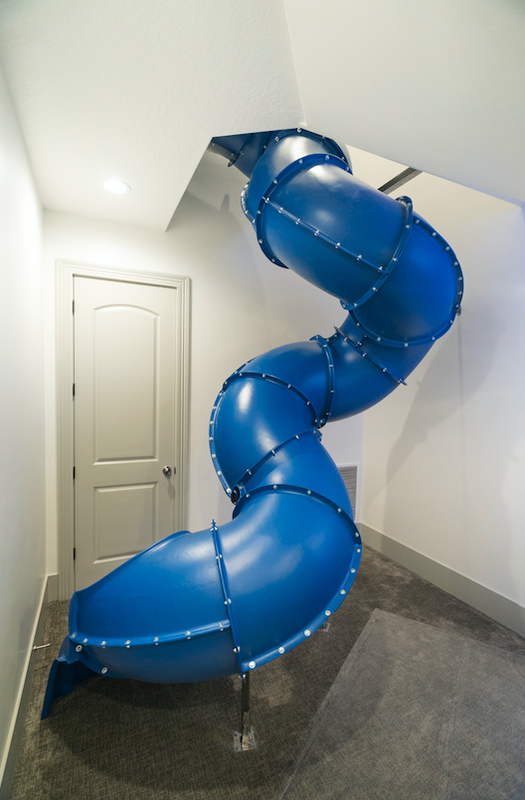 Then when the idea of entering the build in the 2018 Utah Valley Parade of Homes came up, it was a no-brainer. 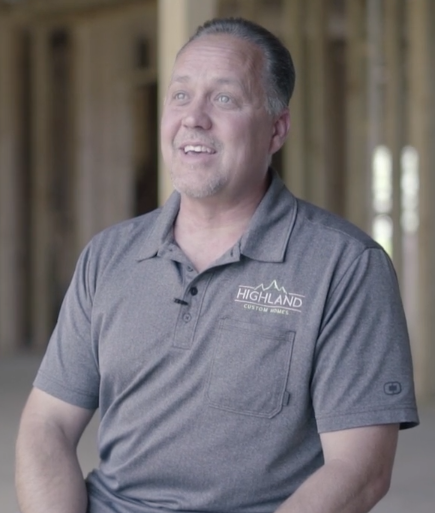 Watch the video to see what their experience was like building with Highland Custom Homes, a custom home builder in Utah. What are our favorite features inside the Chateau d’Elegance? Let’s look at each of them. As we started work on the Deaton home, Melinda came to us about wanting to do all the interior designing of the home. 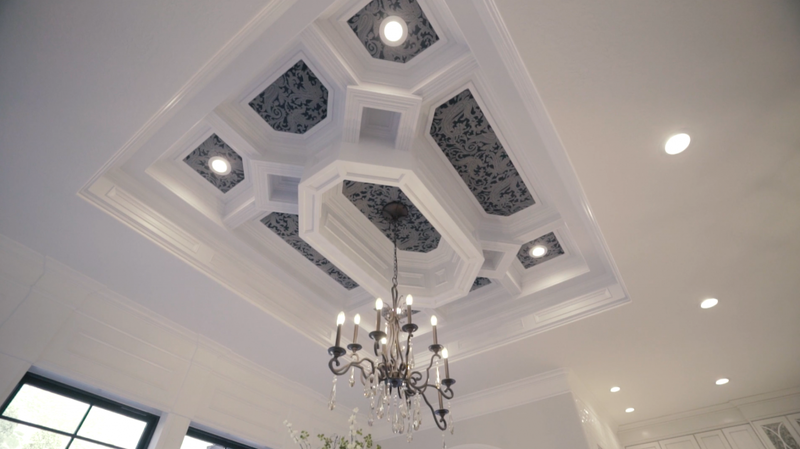 She had always had a passion for interior design and we couldn’t wait to see that passion come to life in her very own home. And if the results don’t speak for themselves, let us. Check out some of Melinda’s interior design work on her Instagram, @melindadeationdesign. 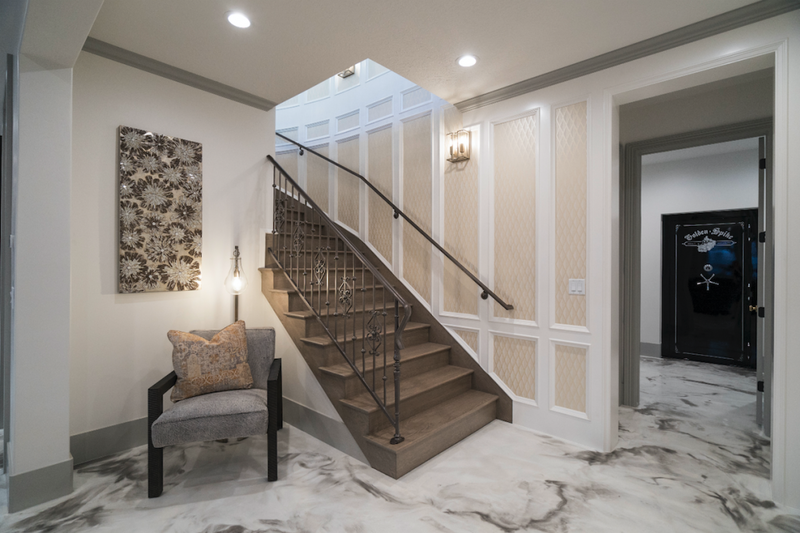 Many Utah Valley Parade of Homes goers couldn’t get enough of the white marble flooring in the basement and we can’t blame them. Melinda had dreamt of that flooring for a long time but didn’t know if it was possible. Together with Rad Concrete Coatings, we were able to see that vision through. Another design element we love is the fabric inlay in the dining nook area. Melinda and our finished carpenter came up with the design and our finished carpenter made it happen. For 10 days, he went up and down, scaffolding 484 pieces into the ceiling for a result that’s like no other. 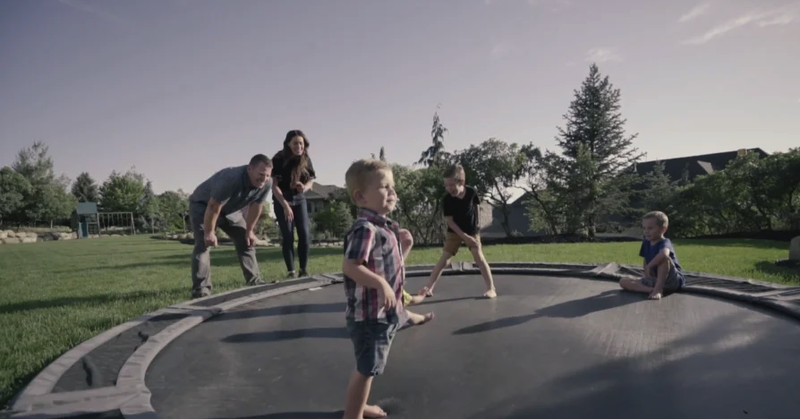 With four boys in the Deaton family, you bet they wanted to include some kid-friendly features. Boy, did the home deliver. 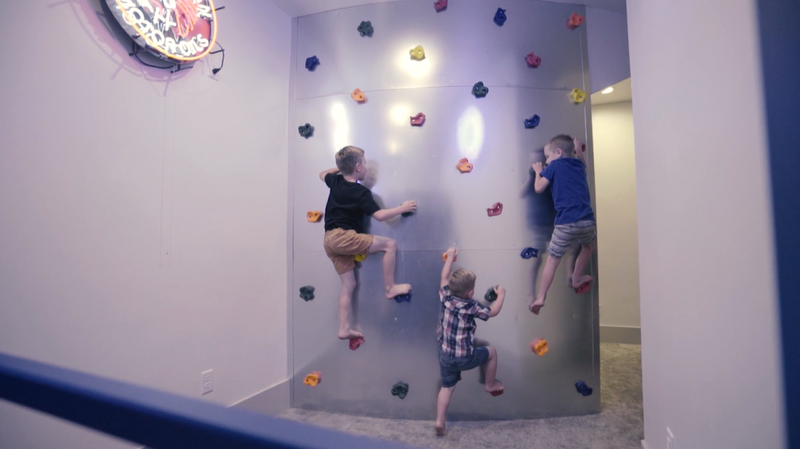 From the interior slide and rock climbing wall to the amazing home theater, the Chateau d’Elegance features some of the most creative elements that any kid would go crazy for. The kitchen is the center of any home—the Deaton’s is no exception. Their open-concept kitchen features antique mirror accents in the cabinetry, marble countertops, custom island complete with a breakfast nook, subway tiling, and, don’t forget about the amazing, fabric inlay ceiling. 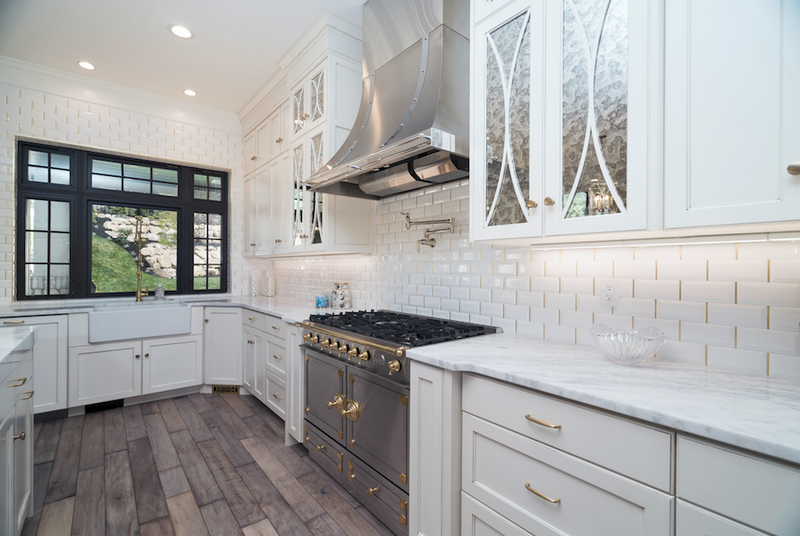 This traditional French themed kitchen is accented beautifully with gold highlights. Gold subtly adorns the backsplash between the simple white tiles, the handles on the refrigerator, and can also be found on the dials on the stove. In fact, Derrick Deaton agreed with us! To walk through their home, watch the video below. Utah Valley Parade of Homes | Highland Custom Homes from Red Olive on Vimeo. Want to experience the Highland Custom Homes difference for yourself? Contact us to talk about your next home.